27th Jan 2017 - What has The English Man been up to this week? Unfortunately our President Simon Brice has been suffering with a chest infection and unable to attend, this his last AGM as President. His brother Peter stood in for Simon and delivered Simon's Presidential speech. Peter was accompanied by Simon's wife Cynthia who told me Simon was very disappointed that he could not attend. Following the AGM - the Trophies for the Annual Orchard Competition were awarded to prizewinners, with the Overall Best Orchard won by A.C.Goatham & Sons for their ZARI orchard at Shrubbery Farm. The 'Silverware' was presented to Piotr Bukowski - Goathams Production Manager by EKFS Chairman Alex Cooke. 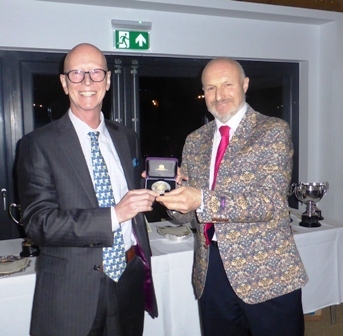 The prestigious David Hilton Memorial Medal was presented to Andrew Tinsley by Chris Rose who gave an excellent review of Andrew's achievements; the two have worked together in parallel careers and enjoy a fine friendship, enabling Chris the opportunity to add humour to the presentation. 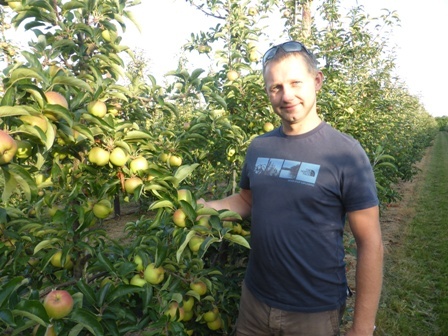 The 2016 Orchard Competition produced a number of 'trophy winners' - The Winning Cox orchard went to David Butler at Greenacres Farm: The Winning Gala & Winning Braeburn orchards were both won by Adrian Scripps Ltd at Wenderton Farm managed by Russell Graydon. 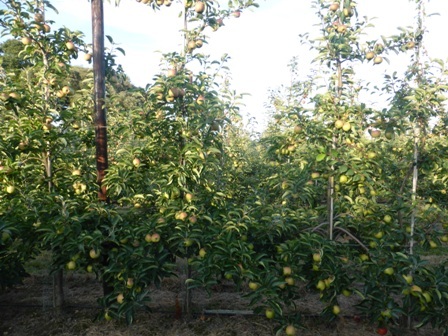 As mentioned; The Top Fruit Orchard of the Year was won by A.C. Goatham for a Zari orchard at Shrubbery Farm. The winning pear orchard belongs to Simon Mount at New Barn Farm who took 1st & 2nd Place with orchards P5 & P3. Adrian Scripps Wenderton farm managed by Russell Graydon won the 'Most Commercial' orchard, The Hygiene Award and the Best orchard over 1,000 trees per acre in addition to winning the Gala & Braeburn best orchards. Once again Simon Bray was a Trophy Winner with the Best Culinary Orchard. A.C.Hulme 'cleaned up in the The Stone Fruit Orchard Competition: Tom Hulme collected the 1st prize for Cherries; 1st & 3rd places for Plums and 1st place for any other stone fruit (Apricots). 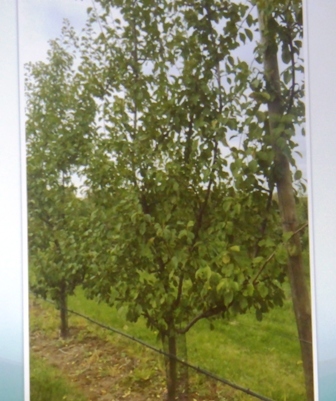 Little Hoaden Steel Posts Cherries won the Stone Fruit Orchard of the Year Trophy. Before moving onto another 'Journal' subject; the President & Chairman stood down and the new incumbents chosen by the EKFS Committee were endorsed by the membership. Simon Brice, who has been one of the UK's most distinguished fruit growers and for the last few years President of EKFS has decided to stand down; Simon has been an excellent President attending all EKFS visits and presiding over the annual AGM's with his natural charm and eloquence. We wish you well Simon and hope you will still join us at occasional farm visits and next year's EKFS Dinner. Our Chairman Alex Cooke stood down after two years in his role; Alex will be replaced by Russell Graydon who manages Adrian Scripps Wenderton Farm and is strategically well placed at the centre of the East Kent region. The new President is 'The English Apple Man' who was surprised to be asked but honoured to accept a role with our most active fruit society. 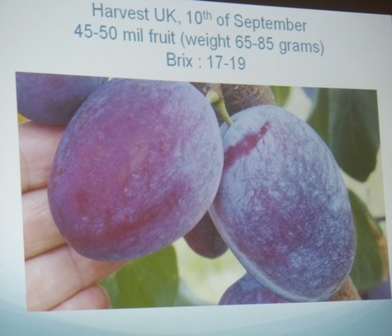 At the recent Agrovista Technical Seminar, Leon Jahae looked at the future of UK (and European) Plum growing. Leon's professional advice to growers covers all aspects of apple and pear production, as well as covering stone fruit growing, including all facets of cherry and plum production. 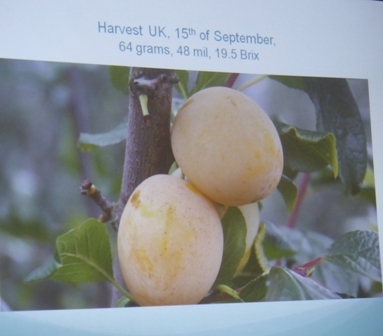 In the UK, his services regarding Top Fruit Growing are solely available through Agrovista UK. 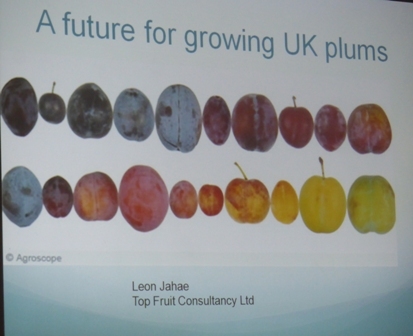 While his services outside the UK and UK services not aimed at Top Fruit Growers are available directly through "Leon Jahae Top Fruit Consultancy". About 20 varieties dominate the commercial supply of plums, and most originated in either Asia or Europe . Originally from China, these plums were introduced into Japan some 300 years ago, and were eventually brought from there to the United States. Most varieties have yellow or reddish flesh that is quite juicy and skin colors that range from crimson to black-red (but never purple). They are also clingstone fruits; that is, their flesh clings to the pit. Japanese plums have a low winter chill requirement. 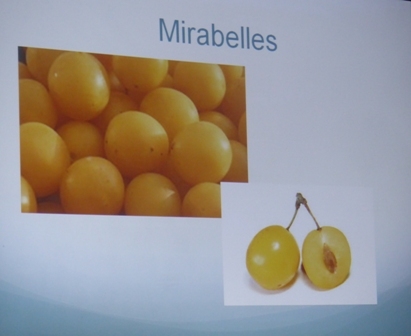 In contrast, European-type plums are smaller. They are often blue or purple, and their pits are usually freestone, meaning they separate easily from the flesh. The flesh is golden-yellow. European plum is an ancient domesticated species, known only in cultivation, now cultivated in temperate areas worldwide. This species is thought to be a hybrid of ancient origin with parentage derived from species native to the Caucasus Mountains and Caspian Sea region. 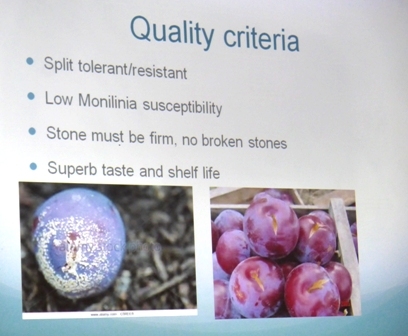 European plums require a higher 'winter chill' to deliver quality blossom. 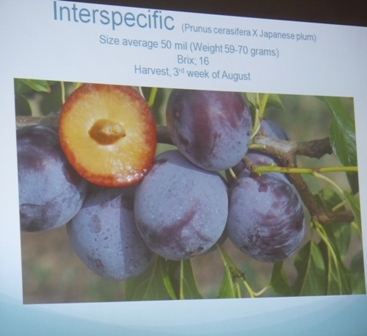 Leon Jahae points out that Plum growing is in decline; there is a a lack of innovation of European plum, he said the most common varieties planted are still Stanley and President (globally). 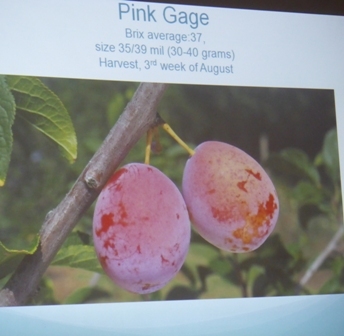 The poor quality of fruit available in the fresh market, which Leon identifies as more a problem related to incorrect harvest timing; generally too early, rather than objective qualitative limits of the varieties. Group 3 - the niches? 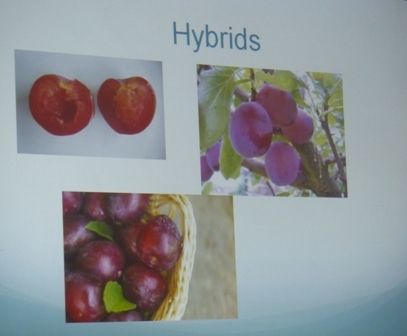 Leon Jahae believes a narrow hedge (wall) will be the format for future plum production, with the fruit all grown on the outside to maintain uniformity of quality. This will also ease hand thinning and picking and make 'Mechanisation, robots and automation' easier to accommodate. Leon proposes trees that will be not necessarily tall, but alleyways will be narrower; tree spacing 1.50/1.75 metres and alleyways as narrow as machinery will allow. When I buy plums, the texture and taste are at the top of my list of 'desires' - Opal, Reeves Seedling, Avalon, Jubileum, Victoria and Marjories Seedling come to mind. A friend and a very fine grower of apples and plums; Michael Bentley at Castle Fruit farm at Newent in Gloucester grows some of the finest plums available. Click on Castle Fruit Farm for more information.